CONSPIRACY CINEMA: A Guided Tour Down The Alternative Media Rabbit Hole – Schlockmania! There has never been a better time for alternative media than the last 15 years. Cheap video cameras, computers and editing software have made the means of production easy to obtain and use. Better yet, the internet has proven to be the ultimate content delivery platform, allowing anyone to make their voice heard if they’re willing to yell loud enough. Viewpoints previously confined to the outer fringes of public discourse now have the means to be heard clearly by a large audience. As a result of these developments, a whole new wave of documentary cinema has risen to prominence. It is often distributed through the internet, sometimes anonymously on YouTube, and does not bow to the standards and practices of a major media outlet or film studio. 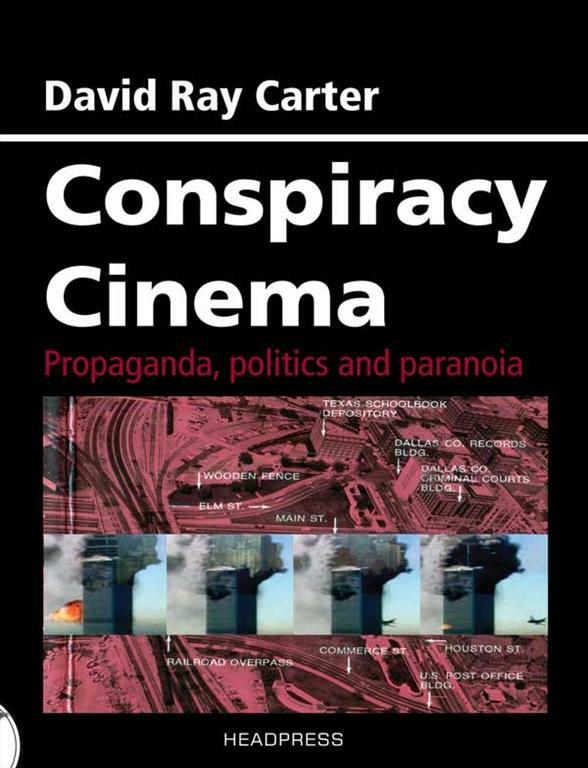 Author and critic David Ray Carter has dubbed this movement “Conspiracy Cinema,” because its focus is the exploration of theoretical conspiracies behind all manner of international events. Carter has also used this phrase as the title for a recent book-length study of this genre that has been published by Headpress. As this book reveals, the subject can be both daunting and complex – but Carter’s useful guide allows you to understand its breadth without having to plumb its depths. Any major conspiracy you can think of is covered here. Carter wisely begins with chapters on films about events that easily lend themselves to conspiracy theorizing: the JFK and RFK assassinations, 9/11 and the siege at Waco, to name a few. The middle section of the book is devoted to a pair of the most complex and popular far-ranging conspiracy concepts, the Illuminati and the New World Order. The remainder of the book covers a variety of less-documented but no less interesting topics, including environment and health-based conspiracies. The first thing you’ll notice about Conspiracy Cinema is that it has an unusually objective and measured tone for a book about such a fringe subject. Carter is a scholar on this topic but he is not an advocate and never tries to sway a reader towards or away from belief in a particular topic. Instead, he evaluates each film on the basis of the filmmaking skill and whether or not it makes a solid case for the conspiracy it is documenting. He’s not afraid to point out when a film is getting into tinfoil-hat territory but manages to do so in a tactful way that makes logic the focus instead of ideology. Conspiracy Cinema also benefits from the way Carter strives to make his potentially obscure topic accessible. This begins with the thoughtful structure of the book’s chapters. Each set of reviews is prefaced with an introduction that breaks down each theory in an easily understood way: first the incident that inspired the theory gets a description, which is followed by the official explanation of the incident and finally the major conspiracy theories. Thus, even a conspiracy neophyte can have a working understanding of the theory in question before reading the reviews. That said, the reviews are the main selling point for this book – and thankfully they are both well-written and concise. Carter never belabors his points and is able to describe how the language of the filmmaking either makes a case for or derails the theories of the filmmaker in question. He is also knowledgeable about film history and works in a few “legitimate” feature film productions that deserve mention alongside the independent productions that are his main focus: for example, the chapter on John F. Kennedy assassination includes writeups of JFK and Executive Action while the chapter on the Abraham Lincoln assassination includes a review of The Lincoln Conspiracy. Finally, Carter fleshes out his critiques with details about the careers of the filmmakers involved in each movie. This provides some of the most interesting material in Conspiracy Cinema as the personalities who make these films are often larger than life. Good examples include Alex Jones, an ever-more-popular figure who has built an empire on the conspiracy theory business, and David Icke, whose theories revolve around the idea of the Illuminati being reptilian aliens who disguise themselves as human beings(!). Simply put, Conspiracy Theory is a must-read for anyone interested in the outer fringes of the cinematic world. If you’re going to jump down the conspiracy theory rabbit hole, you’ll want to have this book as your guide. It just might help you keep your sanity in that strange world.